Kid Geniuses Too Smart for Science Fair? | News and Features | Style Weekly - Richmond, VA local news, arts, and events. Kid Geniuses Too Smart for Science Fair? Mythili Pulavarthi, 14, presents her research on how a commonly used growth factor affects human embryonic stem cells. At the Metro Richmond Science Fair, you find all the usual suspects. Bean plants. Brine shrimp. Bread mold. And then there's the Effect of Concentration of Basic Fibroblast Growth Factor (bFGF) on the Quantitative Analysis of the Undifferentiation of Human Embryonic Stem Cells. The researcher behind this project is Mythili Pulavarthi, a 14-year-old freshman at Godwin High School. She worked on her project in the chemical and life science engineering labs at Virginia Commonwealth University. Of the 279 high-school and middle-school children who compete in Saturday's fair, quite a few show work they did in collaboration with university researchers. 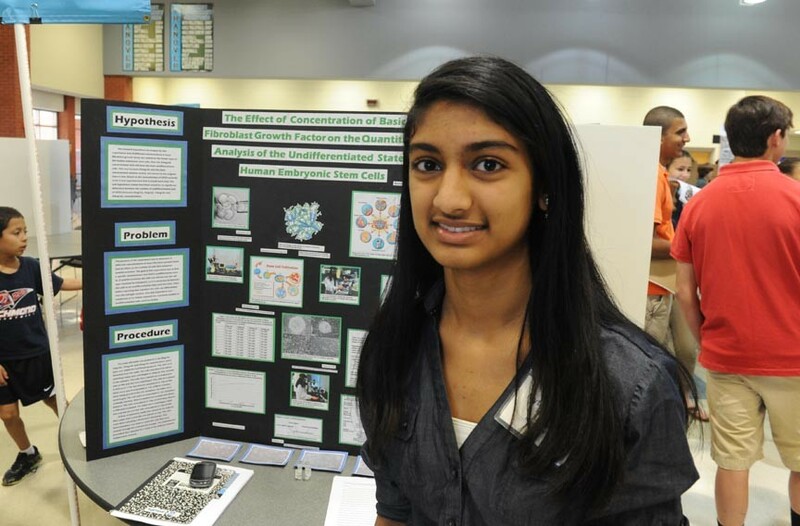 Lakshmi Bodapati, a 15-year-old sophomore at Tucker High School, spent eight months in a VCU biochemistry lab for her project, the Effect of UVB Radiation on the Sphingolipid and Eicosanoid levels in Adult Human Epidermal Keratinocytes. The short version: She's studying a cellular mechanism linked to skin cancer. "I had a lot of issues understanding the background," Bodapati says, "because this is post-college-level research." At the time she hadn't even taken high-school chemistry. Her VCU mentor told her she could figure it out on her own. In its 20th year, the fair has grown much more competitive since 2002, says Martha Vogel, the president of the Virginia State Science Fair. That's when the fair began sending its top two winners to compete in the prestigious Intel International Science and Engineering Fair. But having graduate-level lab facilities and mentors isn't enough to guarantee a trophy. Judges want to know that a child's project is original, not merely an offshoot of university researchers' work, Vogel says: "You have to be more creative, you have to put a lot of work in." Amanda Schanz, a student at the Math and Science High School at Clover Hill, beat out Pulavarthi and eight other competitors to take first place in medicine and health. Working on her own, Schanz discovered a possible correlation between birth spacing and breast cancer diagnoses. Women born less than 36 months after their next oldest sibling were 65 percent more likely to develop breast cancer, her research found. The grand-prize winners are the same two who won last year: Samantha Marquez, for Ex-Situ Bioengineering of Hepato- and Neuro-Celloidosomes, and Jeffrey Holste, for his math project, On Convexity Preserving Set Structure. Please don't ask us what any of this means.